Keratitis: resulted in by viruses, bacteria, parasites or fungi and causes damage to the corneal. 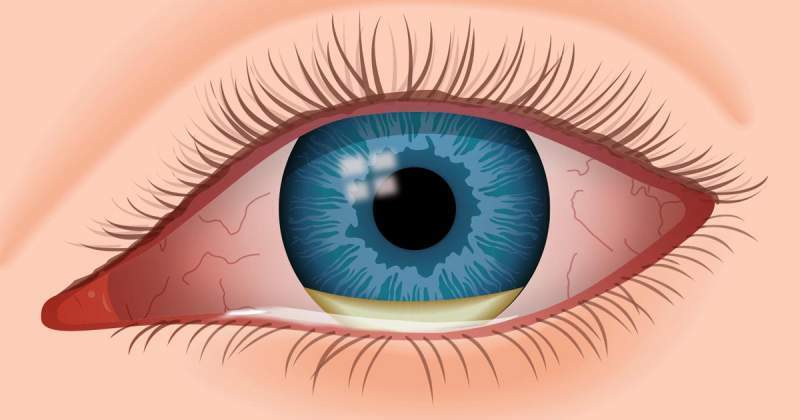 Hordeolum or Stye: resulted in by staphylococcal bacteria and causes pain and itching to sufferers at the red lumps at the base of an eyelash or on the eyelids. Conjunctivitis: caused by bacteria, viruses or allergies and leads to the red eyes. Blepharitis: caused by the obturation of the tiny oil glands near the base of your eyelashes leading to the infected eyelids. It leads sufferers to discomfort, itching, and pain. Dacryocystitis: an infection in the tear duct. Orbital Cellulitis: caused by bacteria and leads to infection of tissues around the eyes. Common eye infections will not cause any serious side effects to your eyes, but it will make you uncomfortable and painful. To ensure your condition, you should see your doctor for the exact diagnosis. And once you're sure of your eye infection, try the home remedies we've introduced below to take care of your eyes at home instead of using the drug. This method is applied to take care of conjunctivitis or stye as it helps promote blood circulation due to the high temperature. Also, warm compresses can also reduce pain and swelling for sufferers. Remember to clean all the scales collected or oily debris on your eyelashes or eyelids daily. If you get infections in both of your eyes, you need to use the separate towel to perform warm compresses for each eye. Using the saline solution to clean your eyes is a very effective method for eye infections because it helps to clean up the debris collected as well as to destroy the bacteria causing the infection. Your eyes will be kept clean with saline solution. Also, this tip also contributes to controlling infection effectively. This is a widely recommended method by doctors for eye infections. You should not use tap water because it consists of some impurities and chemicals which may affect your eyes. In case you don’t want to make the saline solution yourself, you can buy it at the drug stores. However, you need to ask the doctor for a suitable one for washing your eyes. Honey has antibacterial properties so it will be very helpful to care for infected eyes. Many studies have shown the effective abilities of honey in reducing the swelling, pus discharge, and killing bacteria for eye infection suffers. Honey is often used for conjunctivitis. You should choose organically raised honey or a trusted source of honey to treat your eye infections. Green tea is well-known for its anti-bacterial and anti-inflammatory properties, so it not only helps prevent eye infections but also is beneficial for the overall health of the eyes. Tannin acid in green tea is a key ingredient in preventing infections, reducing swelling and redness of infected eyes. By applying this method, you can not only allow green tea to eradicate the infection but also remove dirt or scales collected in the eyes. Chamomile has anti-inflammatory and antibacterial properties, so it has been used as the ingredients to make home treatment for eye infections for a long period. The calmative and soothing effects of chamomile will keep your eyes away from irritation, and redness quickly. You can use chamomile tea as the clean solution to rinse your infected eyes. Not only will you get rid of eye infections, chamomile tea but also can help to eliminate under-eye puffiness effectively. Some people often think that acid is a very dangerous solution, so they worry about whether using boric acid for eye infections will be safe or not. Boric acid is a weak acid. It is often used as a disinfectant or treatment for some allergies, so you can use boric acid to treat your infected eyes. It solves the problem of eye infections such as irritation, redness or reddening due to its anti-fungal and antibacterial properties. Boric acid is also used to wash the eyes and help restore the retina. Note: Don’t keep the rest solution for the next use. Don’t worry about some burning or stinging when applying this tip as they will go away immediately. Turmeric is an herb with high anti-inflammatory and antiseptic properties. Many people only know the benefits of treating allergies and skin infections of turmeric without knowing that it can also be used as a cure for eye infections at home. It will help to remove infections in your infected eyes quickly. Turmeric is also known as a prominent type in Ayurvedic treatment. Apple cider vinegar is very effective in treating eye infections caused by bacteria and fungi. Malic acid included in unpasteurized apple cider vinegar acts as an antibacterial agent and helps your infected eyes improve quickly. Also, using unpasteurized apple cider vinegar to wash your infected eyes helps not only prevent bacteria but also remove dirt and debris from your infected eyes, making your eyes cleaner. Euphrasia, as known eyebright, is an herb which has been believed to treat eye infections for a long time, especially pink eyes and conjunctivitis. The euphrasia's anti-inflammatory fluid-drying ability will help you prevent infection as well as treat the disease quickly. Not only is it used to treat some eye diseases at home, but Euphrasia is also used in the production of eye drops. Ginkgo biloba is used to treat a variety of conditions related to eye infections, especially conjunctivitis. A study of the effects of ginkgo biloba in treating allergic conjunctivitis has shown that this herb has a remarkable effect in the treatment of this disease. Charcoal dust is considered to be one of the best cleansers until now. You can see that it is used in many water purifiers. The charcoal dust can capture harmful bacteria and chemicals in your infected eyes, thereby helping you get rid of eye infections easily. You can use baking soda to clean your infected eyes to reduce swelling, redness, and discomfort. It helps to remove the dirt and excess residue in your eyes to ensure your eyes are clean. Here are the tips to take care of your infected eyes at home with natural ingredients. They are very safe and effective. Try them to get rid of eye infections. All contents provided are for informational and educational purposes. We recommend you consult a healthcare professional to determine which method is appropriate for you.